Every year disasters caused by natural hazards put millions across the globe at risk and cause losses worth trillions. Disasters occur throughout the world, each more destructive than the other. People lose their loved ones, homes, livelihoods and most importantly their resilience, leaving them emotionally weak and unable to bounce back from the catastrophe they have experienced. In most cases; it is not the disaster itself that causes the travesty. Other factors like unplanned and unsafe construction, lack of early warning systems, lack of knowledge on safety measures to be taken before and after the calamity etc. are the real causes for destruction and loss of life. Natural calamities re beyond our control, there in nothing we can do stop them from occurring, but we can surely minimise the damage caused by taking appropriate steps before and after the event. We aim to build resilient communities by equipping the most vulnerable with appropriate tools and technologies, sharing knowledge and skills and promoting linkage among stakeholders to prevent loss of life and suffering in case of a disaster. Acting with urgency to save lives and help affected families get back on their feet is our overarching goal. Some families have almost nothing left to their name after disasters; being responsive to their needs and immediately providing them with some basic items takes away their feeling of helplessness to some extent and also helps ease some of their anxieties. Our humanitarian action includes providing immediate shelter support in form of tents, utensil kits, hygiene kits etc. We also establish temporary learning centers to make sure education continues even in times of emergencies. In many cases, Children are observed to be unable to cope with post disaster challenges due to their physical and psychological vulnerabilities. We provide them with learning kits with the hope of bringing back some normalcy into their lives and ensuring their psychological welfare even after their routines are completely disrupted. Utmost care is taken to ensure that all our work is done in adherence of local cultures and values and with due regard to human dignity. SEEDS stands committed to all its stakeholders and ensures complete transparency and accountability in all its interventions. Disasters and their adverse impacts set communities back by decades and leave them vulnerable to physical, social and economic hardships. This may inhibit large sections of the affected communities to come back even to the base level, let alone develop at par with the rest of the nation. While relief work helps communities fulfil their immediate needs, it is important to have a strong recovery and rehabilitation program as it is not just about restoring what was lost, but also about helping communities bounce back better and building their resilience. We conduct a thorough damage assessment after a disaster to evaluate the quantum of loss. This helps us in gathering of information related to the impact of an event, or series of events, on life and property such as houses, schools and hospitals. Based on this information we form our medium and long-term development strategies. As part of our rehabilitation process we rebuild homes, schools, toilets, community centres etc. All our constructions are low cost and disaster resilient. We build using technology that protects the structures from natural calamities that they are exposed to. We make sure all our solutions are locally adaptable and produce minimum carbon footprints. We believe in creating “ownership” among the communities towards the intervention and therefore, encourage their participation at every stage of the process starting from design development, monitoring, implementation, handing over, to the impact assessment. SEEDS stands committed to all its stakeholders and ensures complete transparency and accountability in all its interventions through various processes such as complaint-response mechanisms, standard operating protocols for all interventions, regular monitoring and audit controls etc. There is often a critical gap between the end of immediate relief work and the many months (or years) it takes for government’s reconstruction schemes and compensation packages to materialise. 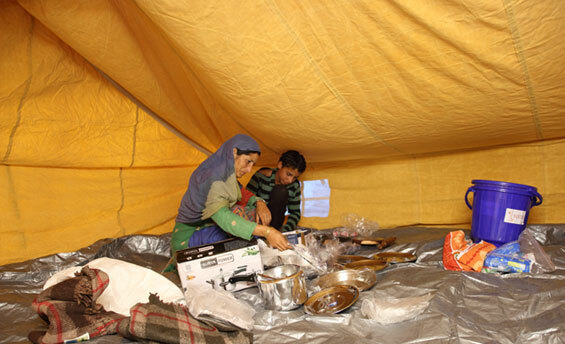 Families cannot survive in tents alone for so long. Rather than risking unsafe rebuilding, SEEDS’ works with the most vulnerable families to create transitional shelters. Lasting up to two years, these follow cultural norms, often using materials that are local and can be re-used later on. The approach is one of incorporating resilience into early recovery. In essence, it looks at the question of transitional shelters not just as a temporary solution; but as the foundation towards permanent housing. While we cannot stop a disaster from occurring, we can definitely minimise its damages. With small investments towards risk reduction we can save countless precious lives. Early warning system is one such example. They help alert a community of a disaster before it occurs, giving them time to take necessary steps to protect themselves. 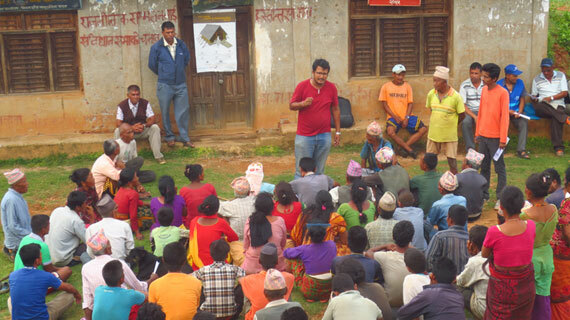 Effectiveness of the early warning system depends solely on the participation of the community. If these systems are too complex for the people to understand, or if the community lacks knowledge on what is to be done after a warning is issued, the systems are of no use. Thus, it is important to install systems that a community understands and capacitate them to respond accordingly. Therefore investment in risk reduction is not just limited to establishing an early warning system. It also includes development of disaster management plans for communities, training programmes for multi-stakeholder groups, demonstrations and drills, taskforce training, village level planning, school safety and a strategic partnership between the government and the community. In the first week of September 2014, the state of Jammu and Kashmir, India, experienced the worst flood that it has seen in 60 years. The incessant rain gave rise to a swelling Jhelum river and its tributaries; submerging houses and leaving people stranded on rooftops. In some places, the water rose to over 12 feet. More than 10,000,000 people were affected and over 100,000 houses suffered damage across 19 districts. Pulwama and Poonch districts were two of the worst affected and it was here that SEEDS began relief distribution efforts on September 17th, 2014. 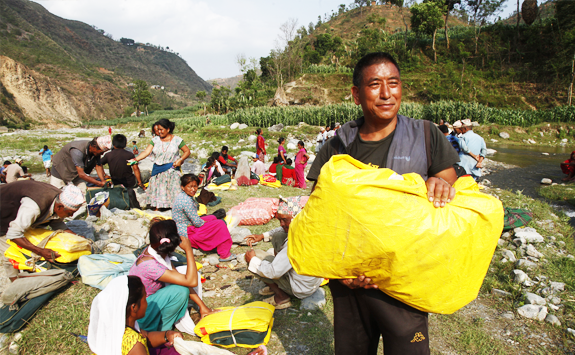 The relief kits were based on identified needs that emerged from the community themselves. This included a shelter kit with tents and bedding; a utensil kit with kitchen essentials; and a hygiene kit. 314 of the most vulnerable families were selected; following a rigorous identification process and an accountable distribution system. The effort was closely collaborated with the district administration and Department of Police. Continuing education was another priority. School kits with tent infrastructure, temporary toilets, hygiene kits, fire extinguishers and students needs, for 23 temporary learning centres in action. Children’s kits were distributed to 2,566 students across 64 schools. A month on, the flood waters had receded. Yet, there was still an urgent requirement for shelters to sustain the most vulnerable families through the sub-zero winter. With the race against time to complete them before the snow fell, the design had to be one that could be constructed very quickly. Finalised in consultation with the community, it kept in line with local architecture but with disaster-resilient safety features such as raised plinth heights and cross-bracing. Emphasis was also given to locally available and salvaged material that could be re-used later on. Local construction skills were used that could be easily done by the community and helped scale up swiftly. With the active participation of the house owners themselves and the tireless work of the local mason-carpenter teams, 100 transitional houses and 42 toilets were built in just two months! They’ve been personalised by families and have also proved a comfortable home through the winter.